Photographed at the Hickstead Fire Show in West Sussex in 1994 was this 1971 Bedford TK/HCB-Angus Water Tender (latterly Water Tender Ladder) of the Dorset Fire Brigade (reg DYD 627J) which saw service at Shepton Mallet,a retained station before joining the reserve fleet and then going out of service in 1986.It then went to become part of the Fireman's World Museum collection at Minehead before finally being purchased in 1988 and then into preservation. Great to see some more TK's Pete.This one is similar to the North Yorkshire pumps, but with shorter rear crew cab doors. Added by Paul Warnock on 22 March 2008. 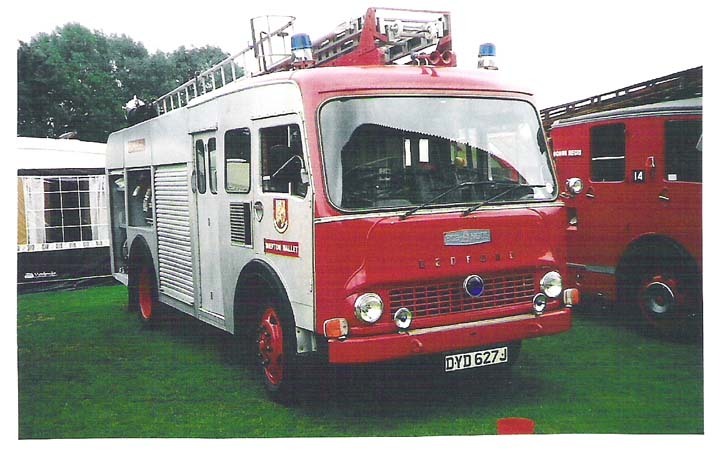 This is an ex Somerset appliance not Dorset.Shepton Mallet is in Somerset and at the time was Station Two Eight. I believe the machine started as the first away full time appliance at Bridgwater before being transferred to Shepton Mallet in 1973 replacing a 1961 Dennis F28. Added by Paul Pickford on 23 March 2008. Sorry Paul, yes your correct, Shepton Mallet is in Somerset and not Dorset.I've been copying alot of old pictures recently and should have been more careful in what I was typing when I sent this one in.Thanks for correcting my mistake. Added by Pete Matten on 23 March 2008. Added by Pavel - Western Australia on 28 March 2008.
again this year at one of the shows i'll take a much closer look. I would though have thought they were rotating beacons. Added by Pete Matten on 29 March 2008. They are rotating beacons made by a company called Marshall/Marchelle, I believe they were a french company. Most Somerset machines of the mid sixties to the mid seventies had them fitted including my Dennis F28.They were not very bright and did not rotate that fast. Added by Paul Pickford on 07 April 2008.
answers your question Pavel.Anymore more questions, ask Paul Pickford. Added by Pete Matten on 07 April 2008. Added by Pavel - West Aussie on 09 April 2008. This one wasn't far from my childhood home in Castle Cary then! Added by George A'court on 27 April 2009. Thanks for this Pete, one of the best machines ever made. It looks like it was on the run at Chedder, but either the slipboard or the ladder are wrong (in the picture it looks like a WrT) as I think Chedder only had a WrL and a Land Rover. Nowadays Chedder also has a Pinzguer but that came after DYD would have gone. Added by Goerge A'court on 30 April 2009. George,yes DYD 628J did serve at Chedder and was originally a(WrL)Water Tender Ladder.Its actual replacement was a Dodge K1113/Perkins/Carmichael (RYD 966R)which was ex-Stn 01 Taunton.Landrover was DYA 683J and was a L4V(Landrover 4x4 Vehicle). Added by Pete Matten on 30 April 2009. Thank you for the info about Cheddars appliances! Do you by any chance know the years they were in use at Cheddar please? Also was the L4V a soft top/ hard top/ pickup? Any more info would be helpfull thank you. Added by George A'court on 03 May 2009. The L4V would have been a short wheelbase soft top,as were most of Somersets,sorry i can't help with dates. Added by Bob on 04 May 2009. UYD 74,again a swb soft top.Cheddar was upgraded to a 2 pump station around 1974. George,the Landrover L4V was a soft top.Sorry I've no details in reference to when they were on the run,or when they went out of service.Maybe are friend Ian Moore might be able to come up with something from his historical database. Added by Pete Matten on 04 May 2009. Thank you to you all for the information. I didn't know that Somerset ran mainly soft tops so the information is usefull. I have also discovered elsewhere on the internet that DYD627J had yet another sister 629 and that was apparently at Bridgwater too at some point. Its a pity that that one didn't seem to survive otherwise it would have been possible to see all the batch together at a rally somewhere! From looking at the pictures on this site it appears that quite a few Somerset vehicles are still around. Added by George A'court on 06 May 2009.